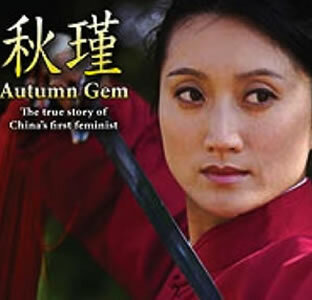 (Nov. 10, 2010)--As part of UTSA Diversity Month, the UTSA East Asia Institute will host a free screening of the documentary "Autumn Gem: The Story of China's First Feminist" at 3:30 p.m., Sunday, Nov. 14 in the University Center Retama Auditorium (2.02.02) on the UTSA Main Campus. Directors Rae Chang and Adam Tow will attend the screening to meet the public and discuss their project. The film is about Qui Jin, a Joan of Arc-style character, who defied tradition to become the leader of a revolutionary army fighting against the corrupt Qing dynasty. The radical women's-rights activist challenged traditional gender roles and emerged as a national heroine celebrated in China today. Chang graduated from the University of California at Berkeley in 1994 with a bachelor's degree in art and anthropology. Her short films have been presented at APAture Film Night in 2003 and the Women of Color Film Festival in 2004.